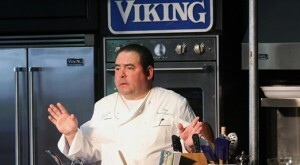 The chef performed two cooking demos during the Viking Classic; first, an "economical and weather-friendly" chicken entree, followed by a fresh and locally grown watermelon margarita (recipe here). Lagasse also mentioned that most of the ingredients and herbs that he uses in his New Orleans restaurants are sourced from Mississippi farms -- and he's been sourcing from these farms for over 28 years, "back when people didn't even know what organic was," he said. Lagasse's partnership with Viking, as well as NFL quarterback for the NY Giants Eli Manning, spans several years. Together, they have raised awareness for the Blair E. Batson Hospital for Children, so much so that Manning now owns a wing of the hospital as the Eli Manning Children's Clinics. During The Viking Classic at Annandale Country Club, over $50,000 was raised for this non-profit organization. "A lot of people that look up to me are children, and so my efforts about whether it's my foundation or the Children's Hospital are important to me to give kids a chance," said Lagasse. "You know, they're the future."